Shipping container architecture has seen increased popularity over the years. This is largely due to the fact that containers are a much cheaper building system, as compared to conventional ways of building, and they are simple building inputs. 1. It takes far less time to transform a container into a living space! All it takes to have it from being the cargo carrier to being your comfortable home is, changing the floor, insulating the walls, and adding fixtures and windows. 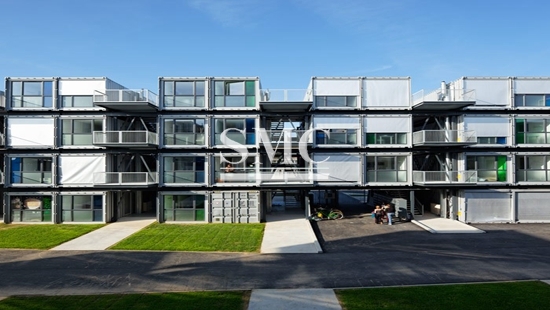 At SMC, we have specially made, pre-fabricated container houses which are fitted with plumbing, electricity and fixtures. 2. It takes less time to have the structure ready for people to live in, as opposed to building with bricks which are stacked one by one, a container is already a sturdy structure, thus, time taken to build from scratch is saved. 3. Containers used as apartments save a lot of land, as they can be easily stacked up to make an array of apartments. They are a perfect solution for housing in busy, overcrowded big cities and metropolis as they serve well to solve the problem of student housing and bachelor housing. 4.Container apartments help tenants to enjoy affordable rent! This is tangible reality can be seen here where container apartments were built up in London strategically for young people to be able to live comfortably and be can afford to pay rent. Since containers are a cheap input, hence the cheap rent! 5. Containers have high strength in their own structure, therefore it makes building with them very simple and more stronger buildings result. The high structural strength also enables homes to built in otherwise difficult-to-build areas such as wilderness homes and other adventurous types of homes. So, why not reduce costs spent on building, while you save on construction time with container apartments? Visit our website to get more information about our container range, we are a leading manufacturer and supplier of containers in China.